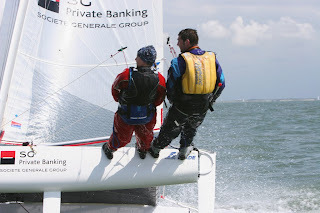 Footage from the Gulfport regatta we did in Florida! A little bit of video from Gulfport. The sequence of Matt and Gina is from the 2nd day when the winds finally picked up to 8-10, everything filmed by The Chuck. Thanks to Travis Edwards for putting the video online. 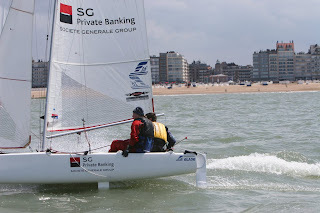 Last Saturday we sailed the first Gambler's long distance race (open for F18 and F16 only). A fun race with an unusual rating system. In fact you had to rate your own sailing skills. At the briefing (12:00) the course was given, together with the finishing time: 16:00. Then we had one hour to estimate the length of the course (17 miles) and how long we would sail on it (taking decreasing wind and current into mind). By 13:00 we had given up our starting time and the times of the other crews were also revealed. If you finished before 16:00 you kept your original starting time. For every 5 minutes you finished after 16:00 you were deducted 10 minutes of your starting time. The overall winner was the boat with the latest starting time after deduction of any penalty minutes. 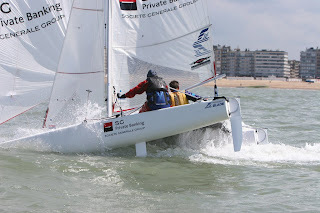 We entered with an estimated 1h35min of sailing and had our beach start together with a Cirrus F18 at 14:25. In the mean time the Inter18 and Mattia had already taken off. 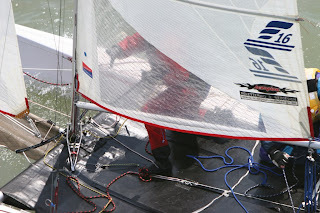 5 minutes after us the 2 infusions started and another 5 minutes later the Nacra F18 started in last position. All of the starting positions were kept, only the Infusion (who won the race) did catch up with us and even passed us! In real time they sailed 7 minutes less on the course. We started off with 7 knots of wind I guess, 30 minutes upwind to the first mark (the marks were 4 weather stations). 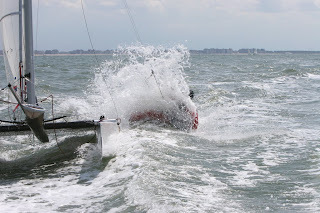 We had a bad beach start, not because of Kathleen’s running skills but because apparently I didn’t attach the port rudder properly to the transom, meaning we lost 2 minutes on the water getting the rudders ok…. By the time we were at the upwind mark we almost catched up with the Cirrus. They were double trapping but sailing a lot deeper than we did. I could only trap myself but we could steer much higher. Then down to the second mark (downwind leg). The wind was a little gusty, between 5 and 10/12 knts I would have guessed. On the first leg we went past the Cirrus and were really going fast. Then we made the mistake to go too far to the beach where it was much gustier, making it difficult for us to keep the boatspeed up. By the time we were at the 2nd mark, the Infustion overtook us and we were again a couple of seconds behind the Cirrus. At that time we were already racing 55 minutes and only half way the course. I thought we would never make it on time. 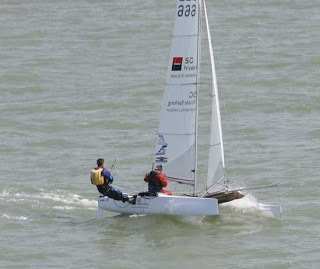 The leg to the last mark was a half wind one and from the last mark back to the sailing club also half wind. Meanwhile the wind had picked up and was blowing 10 to 12. The waves started picking up forcing us to stand way back in trapeze. 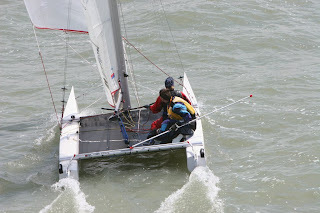 Because of the gusty wind and the bigger waves we had to head up once in a while causing us to end to high at the last mark. We were right behind the Cirrus but had to sail straight downwind to round the mark. There we lost valuable minutes again…. Apparently we sailed quite fast on the last 2 legs, cause we finished close to 16:00… Only 3 minutes late! We haven't been sailing much recently. Or there was too much wind, or too much rain or no wind at all. So not the conditions we expected for the beginning of June. We are hoping the summer will start soon. 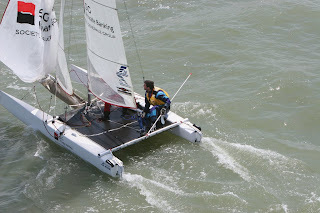 Forecast for tomorrow: 12 knots at 14.00, afterwards declining to 9 knots. Air temp: 16°C and apparently no rain. Let's hope so! Afterwards we'll get back to you on how the race went, what we had to do and hopefully some funny pictures too!